IT might look like the latest block of trendy luxury flats planned for Camden Town, but these are homes with a difference, and the cross in the front garden is the giveaway clue. This artist’s impression is how Father Bruce Batstone sees the future of St Paul’s Church in Camden Square, but the redevelopment plan has angered neighbours. His team have worked with a property developer on plans for four floors of flats – a mix of private properties and affordable housing – which would sit on top of a new-look, ground-floor church. St Paul’s is working on its first major redevelopment plan since it was damaged in the Second World War and rebuilt afterwards as a single-storey building, initially planned to be temporary. The church hall, used by dozens of community groups, would be retained under the plans. The church maintains the new building will be the same height as it was before the wartime bombings but neighbours who have seen the designs have been startled by the proposed size of the development. 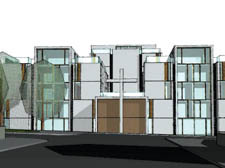 The number of flats in the development has yet to be decided but Ms Powell insisted there would be “more affordable than luxury” and that the church would have complete control over the development. Designs will be on view to the public at St Paul’s Church from 2pm to 6pm from Tuesday to Thursday and from 7pm to 9pm on July 17, 19 and 20. Looks a good development and glad to hear of affordable houseing. It is good the community hall is to be retained.